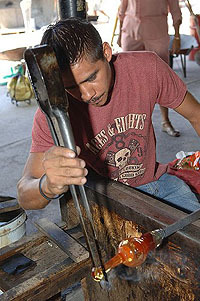 Mexican Glass, See Pictures and Video of Mexican Glass being produced. Find Authentic Mexican Glass from Mexico for your Kitchen at Magellan Traders. Today Mexico is very well known for affordable, rustic, hand blown Mexican Glass drinking glasses, the most popular of them characterized by a cobalt blue band at the rim. Confetti colors can also be achieved by adding crushed glass of the desired color. Watching the artisans at their craft is mesmerizing. The technique is truly fascinating. Glass making was unintentionally discovered by potters around 3000 B.C. The glass blowing technique was invented around 100 B.C. The very first glass made in North America was in Mexico in 1535 by artisans brought by the Spanish from Europe. Although these original glass works were short lived, glass blowing was reintroduced into Mexico hundreds of years ago and flourished, due largely to the simplicity of the ingredients and the ingenuity of the Mexican Arts and Crafts Tradition. 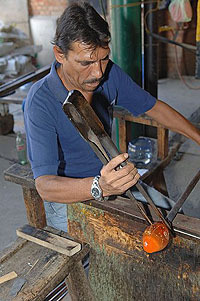 See images below of Artisan glass blowers from Mexico, hand blowing a red rim wine glass start to finish from melted, recycled, lead-free soda pop bottles. 1. The Glass Blower is dipping the molten glass ball into water to cool it down to the perfect temperature for him to work with. 2. 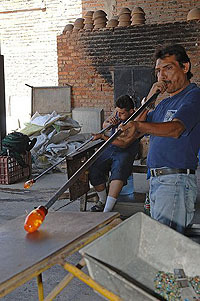 Two Glass Blowers are blowing air through the tubes to make the molten glass shapes larger to work with. 3. 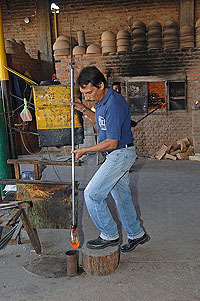 The Glass Blower is sculpting the end of the molten glass to make the desired glass piece. 4. 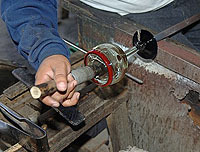 By using long metal tools the Glass Blower is able to pinch the molten glass and pull on it forming the stem of the glass. 5. 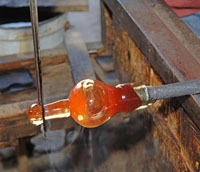 The Glass Blower is putting the finishing touches on the stem so it is ready for the base to be attached. 6. 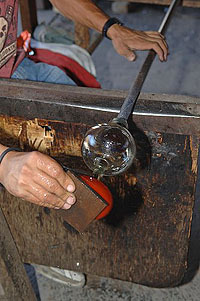 The Glass Blower is carefully attaching the red base to the rest of the glass. 7. With a solid piece of metal he is turning the tube, making the base flat. 8. With the glass turned around, he is using another metal tool to smooth the inside of the wine glass. 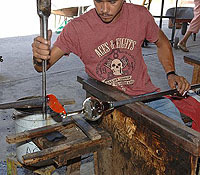 Glass blower artisans have produced glass items in a variety of shapes and sizes. Including, Wine Glasses, High ball glasses, Ice tea glasses, Tumbler glasses, Martini glasses, Margarita glasses, Shot glasses, Beer glasses, and a variety of Margarita pitchers and round Bola Pitchers. Originally, Mexican glass was called "bubble glass" because of all the bubbles produced when methods were not as uniform as today. Now days glass blowers that can blow large bubbles inside the glassware are considered to be "Master Blowers"
Pitchers and glasses can be clear or with colored rims and bases in blue (cobalt), turquoise (teal), amber (brown), red and green. We also have an Ice Tea glass that the glass blower "pinches" when it is hot, producing the perfect places for a hand to grasp the glass even when they are wet! Large glass factories overseas have tried to imitate the techniques of our native blowers; but the machines that make the glass make it very thin and uniform. If you are looking for every glass to be the exact same height and color shade, then Recycled Mexican Bubble glass is not for you. Click here for more information on our hand-blown Glassware from Mexico. Open Monday-Friday 9am-5pm Mountain Time. Or e-mail us, we answer emails 7 days a week. Our Pitchers are sold separately, glasses in a minimum of 2 per style. Each Piece of our Mexican Glassware collection has been hand blown by one of the many talented artists in Southern Mexico. No two drinking glasses will ever be identical, which is part of the elegance and uniqueness of the traditional Mexican hand blown glass. You might see a slight variation in color, bubbles, slight blemishes, and size from glass to glass. This is perfectly normal. We have been importing from Mexico for many years now and have very good quality control that brings our customers the finest glasses coming out of Mexico. It is not normal to feel rough or jagged bottoms that have not been sanded down properly or miss-colored or rough rims. This does not happen very often, but we are glad to replace any unacceptable glassware to make our customers 100% satisfied. At Magellan Traders and A thru Z Imports, LLC we offer only authentic, handmade and one-of-a-kind imported functional and decorative art. We have recently added some beautiful fused glass tableware from the Czech Republic in a multitude of colors which Compliments the Mexican Glass. Visit our unique Nativity scenes from around the world. We now sell Jiaogulan Herbal Tea. Our items really are treasures -- they are unique and no two are alike. Come see our Treasures.